The airport manager manages the airport and all related facilities. He reports to the airport committee and the Mayor. Approximately 2 miles north of the City on U.S. 54 and just 3 miles south of Interstate 72 from Exit 35. The Pittsfield Penstone Airport continues to be a vital link to the “land between the rivers” for businesses and transients alike. 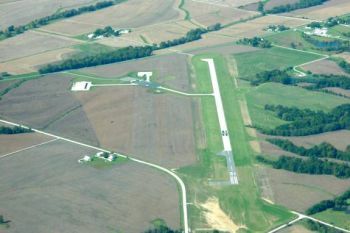 Located between the Illinois and Mississippi Rivers in Pike County, the airport is situated in close proximity to the Central Illinois Expressway, a railroad, Lake Pittsfield, the City of Pittsfield Industrial Park, and Pittsfield itself. Tourism and agriculture are the main industries in the area. Trophy deer hunting and the numerous outfitters have contributed greatly to the increased utilization of the airport. Within the last three years, the runway has been extended to 4000 feet and an AWOS has been commissioned. Recently, the instrument approaches were updated to reflect these changes. A variety of aircraft use the airport on a regular basis including numerous light twins, turboprops, and corporate jets. Competitive fuel prices and the availability of rental cars add to the appeal of this facility. It is my goal to attract additional businesses to the airport, industrial park, and the community at large. I would encourage you to visit the many websites available covering our community and then plan a visit. 24 hour self-service fuel, Courtesy Car, 4000 foot lighted asphalt runway, automated weather observation system (217-285-1428), and pilots’ lounge. Rental cars are available by calling 800-585-2189.